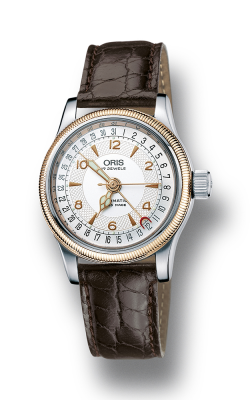 Oris Watches | Long Jewelers Virginia Beach, Inquire Now! There is perhaps no timepiece as exceptional, as accurate, as cherished as a Swiss-made luxury watch—and Oris watches are made in that storied Swiss tradition. First founded in Holstein in 1904 by Paul Cattin and Georges Christian, Oris watches have always been crafted to be luxury timepieces. In the company’s early days, just 24 employees crafted every Oris timepiece; in the years since, the brand’s name and legacy have only continued to grow. Perhaps best known for the innovative “Automatic Movement cal. 645 with 25-jewel lever escapement,” Oris developed and created many complications known today such as moon phases, week days, and additional time zones. Today, the Oris tradition continues, and timepiece connoisseurs can discover the latest styles at Long Jewelers in Virginia Beach, Virginia. Oris watches are beautiful timepieces, an accessory that’s meant to blend together style with classic watchmaking tradition. 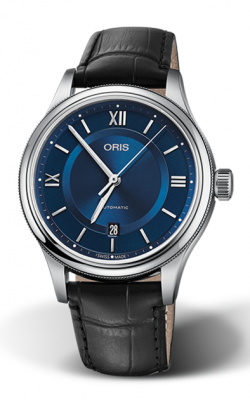 An Oris wristwatch is modern in its smartness, its polish, and its complications. Today, all the company’s watches are mechanical, and added complications make for beautiful and beneficial features. The latest collections of Oris watches are divided into the watchmaker’s four categories: Motor Sport, Aviation, Culture, and Diving. Each of these sets of timepieces features designs and styles with unique details and characteristics suited for that sport or designation. The Oris Culture category features classically stylish timepieces with simple bands and elegant faces, such those of the Artelier collections. The Diving selection, with chronograph choices and water-resistant options, is for the sportier watch wearer. Collections like Divers Sixty-Five and Aquis offer rubber bands or the shine of stainless steel along with dive-specific additions. The Aviation category, with collections such as BC3 and Big Crown ProPilot, blend together functionality with modern style by featuring bold faces and stylish bands meant to stand the test of time. For those who love to drive with flair, the Motor Sport category contains collections which combines the rugged, active features of a watch with tough exterior detailing. Long Jewelers is home to an exciting and stylish selection of Oris watches—and, with the largest jewelry showplace in the state of Virginia, browsing our timepieces in person is truly a one-of-a-kind experience. Home to a selection of exquisite Swiss timepieces as well as high-quality engagement rings, wedding bands, and fashion jewelry, Long Jewelers offers a remarkable and extensive inventory of products. With more than three decades of experience, Long Jewelers is proud to present a team of skilled jewelry and watch experts (including an onsite certified master watchmaker) to guide your visit and provide services such as repairs and customization. Visit Long Jewelers from anywhere—Norfolk, Chesapeake, Portsmouth, Suffolk, or even local Virginia Beach—and experience our quality, value, and service firsthand.